Your payment is non-refundable, unless at the time of application receipt the program to which you've applied is already full. One make-up class may be taken for a missed class with 48 hours notice of cancellation (subject to time and availability). Parents or legal guardians must pick up the child(ren) from class. If the designated adult is not a parent or legal guardian, please state so on the registration form. The parent/legal guardian hereby gives approval and consent for the child's participation in the activities of socialsklz:-). The parent/legal guardian understands and acknowledges that his/her child's participation in the activities is completely voluntary and has familiarized him/her with the activities in which hazards and/or dangers are inherent. Accordingly, socialsklz:-) has taken safety measures to minimize the risk of injury to the participants of such activities. 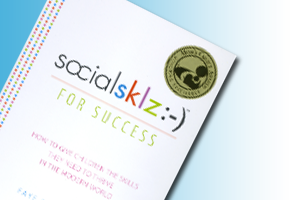 socialsklz:-) cannot ensure or guarantee that the participants, equipment, premises, and/or activities will be free of hazards, accidents and/or injuries. The child and legal guardian agree to abide by the rules and regulations establish by socialsklz:-) for the health, safety and welfare of everyone involved. Participation in or attendance at programs or events sponsored by socialsklz constitutes the voluntary consent of the participant or attendee to: (a) be photographed, filmed or videotaped by a socialsklz representative and (b) the reproduction and use of all such photographs, digital images, films and likenesses for publicity purposes in publications, brochures, advertisements, promotional and marketing materials and all other media venues including the World Wide Web, all without further notice or compensation to participant or attendee who hereby releases to socialsklz all proprietary rights and copyrights in all such photographs, digital images, films and likenesses ( including negatives, positives and prints ) which shall be and remain the property of socialsklz. Children's names will not be associated with photos.